I was so honored to receive a visit from a Icelandic home interior design magazine, Hús og Híbýli last month. 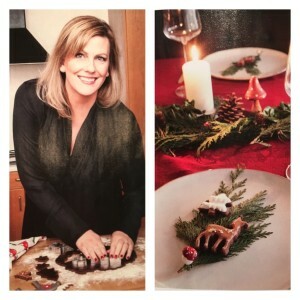 My home and a few of my cookies and cakes were featured in their christmas and new years edition *blushing*. It was so much fun! This christmas season I have baked tons of sugar cookies, both vanilla and chocolate, and decorated them with both Royal Icing and fondant/sugar paste. 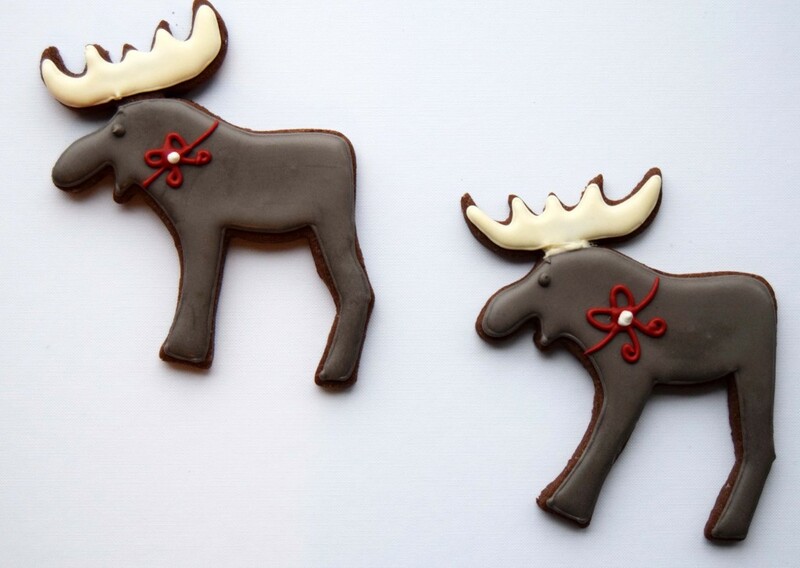 There are endless types of cookie cutters out there and endless ways to decorate them. I got these tuxedo and cookie jar cutters at the Peggy Porschen online shop – how cute?! 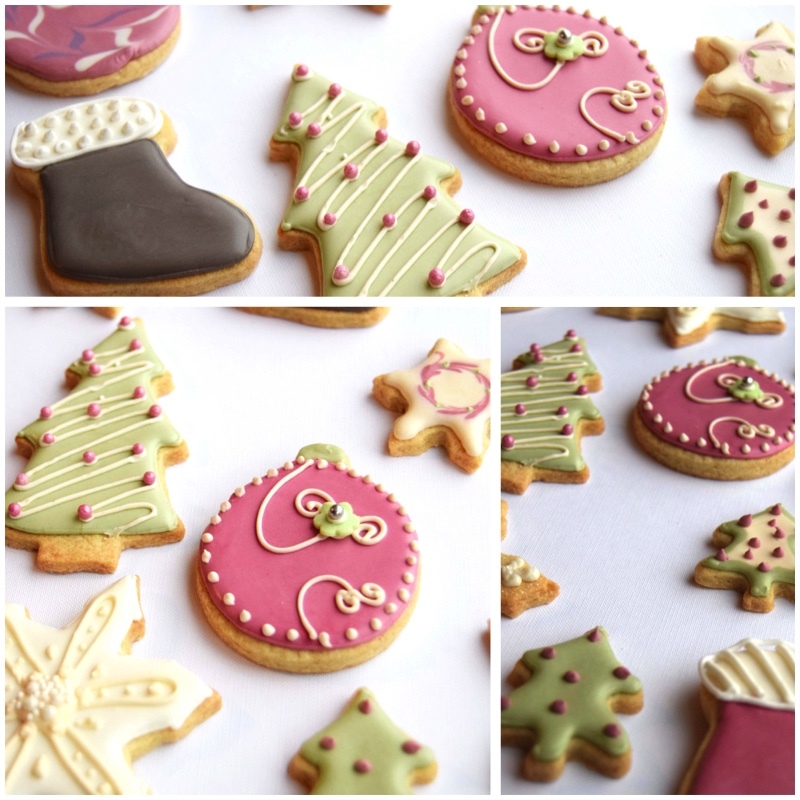 Here you can find the recipe for the vanilla sugar cookies and below is the recipe for the chocolate cookies (based on the recipe from the Peggy Porschen blog) . In the electric mixer with the paddle attachment, cream the butter, sugar and vanilla until well mixed and just becoming creamy. 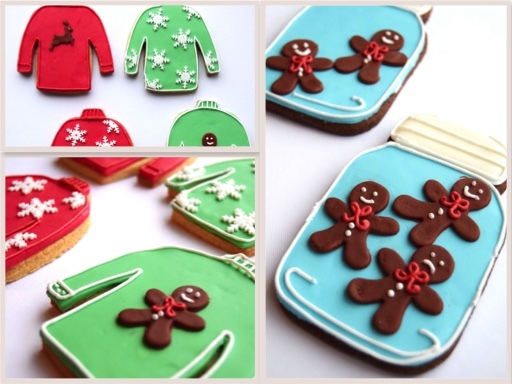 Don’t overwork or the cookies will spread during baking. Beat in the egg until well combined. Add the flour and and cocoa powder and mix on low speed until a dough forms. Gather it into two balls, wrap them in plastic wrap (press on the ball to flatten it out a little) and chill in the fridge for 30 minutes. Place the dough balls (one at a time) on a floured surface and knead them briefly. Cut out approximately 30 inches (80 cm) of parchment paper. Place a ball on one part of the paper and fold the rest over the dough. Roll it out to an even thickness. The parchment paper tends to slide on the countertop so I like to place a silicone mat under the paper to stop it from sliding. Use cookie cutters to cut out the desired shapes and, using a spatula, transfer them on a cookie sheet lined with parchment paper. Chill again for about 20-30 minutes. Bake for 8 – 12 minutes depending on size, until golden brown at the edges. Leave to cool on a wire rack. These cookies will keep well in a cool dry place for up to a month but they taste best the first week out of the oven.